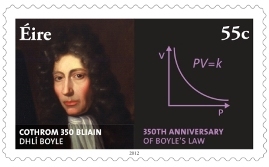 An Post (the Irish postal service) has launched two new stamps to mark two significant science milestones: Dublin City of Science 2012 and the 350th anniversary of the formulation of Boyle's Law. 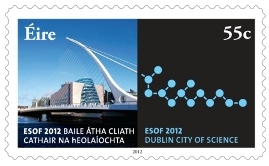 The City of Science stamp shows a photograph of Dublin’s Convention Centre - the venue hosting the Euroscience Open Forum 2012 (ESOF2012) from 12th-15th July - alongside a graphic of DNA’s molecular structure, representing people and their individuality. A second stamp shows an image of Boyle, his infamous formula, with an explanatory diagram alongside. 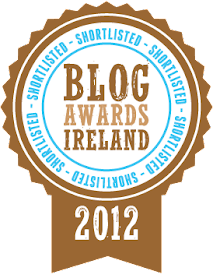 The stamps were created by Dublin’s Zinc Design. 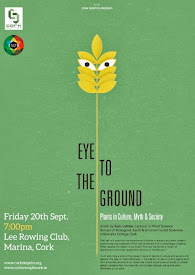 The Dublin City of Science year long programme was developed to mark the honour of hosting one of the most prestigious international science events, the Euroscience Open Forum (ESOF) 2012. 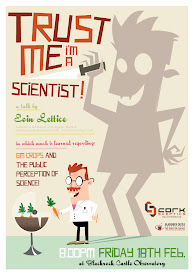 As the City of Science 2012, Dublin will host over 160 events showcasing the best of Irish Science, Culture and Arts. Robert Boyle (1627-1691) was born in Lismore, Co Waterford. Often referred to as ‘The Father of Modern Chemistry’, he first formulated Boyle’s Law in 1662. Boyle’s Law states that the pressure exerted by a gas held at a constant temperature varies inversely with the volume of the gas. For example, if the volume is halved, the pressure is doubled; and if the volume is doubled, the pressure is halved. Robert Boyle will also be commemorated at the Robert Boyle Summer School from July 15-18 at Lismore, Co. Waterford. You can find out more about the Summer School here.